Technical analysis or Charting allows investors to use a range of patterns to assist them with timing their entry to and exit from positions. In contrast to triangles, which are continuation patterns, Wedges are reversal patterns (like Head & Shoulders and Double/Triple Top/Bottoms). They signal a change of trend – via breakout or breakdown – following consolidation within a narrowing range where both support and resistance are either rising or falling. The initial sell-off into the wedge can be steep or gradual. 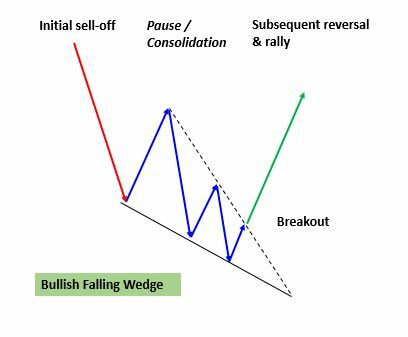 The wedge represents a pause to consolidate, with falling highs and lows in a narrowing pattern being the first sign that a bullish wedge is forming. Once the shares break higher it is possible that a reversal rally – measured from the highest peak to the lowest trough – could be delivered. 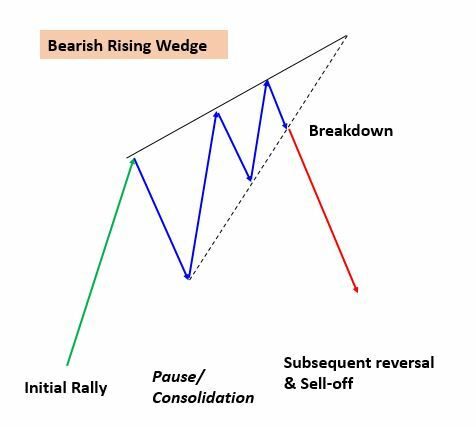 The initial rally into the wedge can be steep or gradual. The wedge represents a pause to consolidate, with rising highs and lows in a narrowing pattern being the first sign that a bearish wedge is forming. Once the shares break down it is possible that a reversal sell-off – measured from the lowest trough to the highest peak – could be delivered. Whilst trade objectives are calculated by assuming and projecting a repeat of the initial up or down move, note that Bullish or Bearish wedges don’t always deliver a move equating to the full wedge height. Sometimes they undershoot. Sometimes they overshoot. And the wedge itself is not always a perfectly neat affair. What is most important is that overall pattern respects the general steps mentioned above.